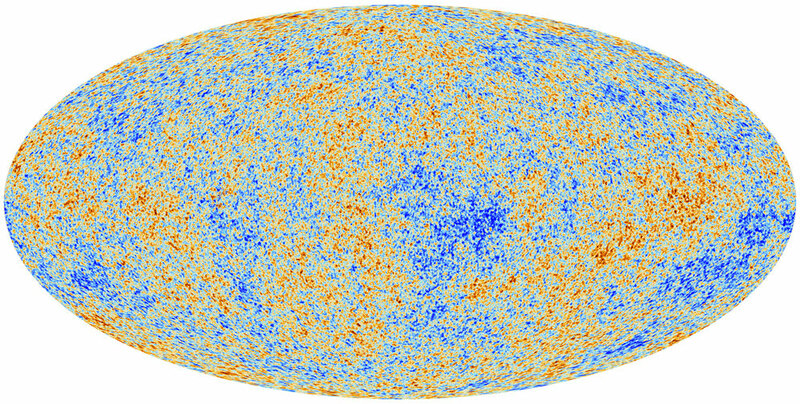 An international team of 250 scientists, including scientists from the Observatoire de Paris, associated with ESA’s Planck satellite mission has published the most detailed map yet of the microwave background, or fossil, radiation of the Universe. The theory favoured by astrophysicists, the standard model of the big bang, toegether with the existence of dark matter and radiation, are in remarkable agreement with the statistical properties of this radiation. However, the instrumental precision is such that certain subtle tiny deviations from the theory could be the tracers of new phenomena at large scales. The image is chock full of detail. This large oval filled with points of various colours, indicating regions which are more or less warm, represents with high precision the intensity of the cosmological background radiation in all directions in the sky. It was produced by the careful analysis of the first 15.5 months of data sent by European Space Agency’s (ESA’s) satellite Planck, launched on the 14th of May 2009 by Ariane 5, from Kourou. Planck’s high frequency instrument HFI, built essentially in France, is the fruit of the imagination of Jean-Michel Lamarre, one of the fathers of the mission, emeritus CNRS research director and scientific head of the instrument at the Laboratoire d’Étude du Rayonnement et de la Matière en Astrophysique LERMA , of the Observatoire de Paris. 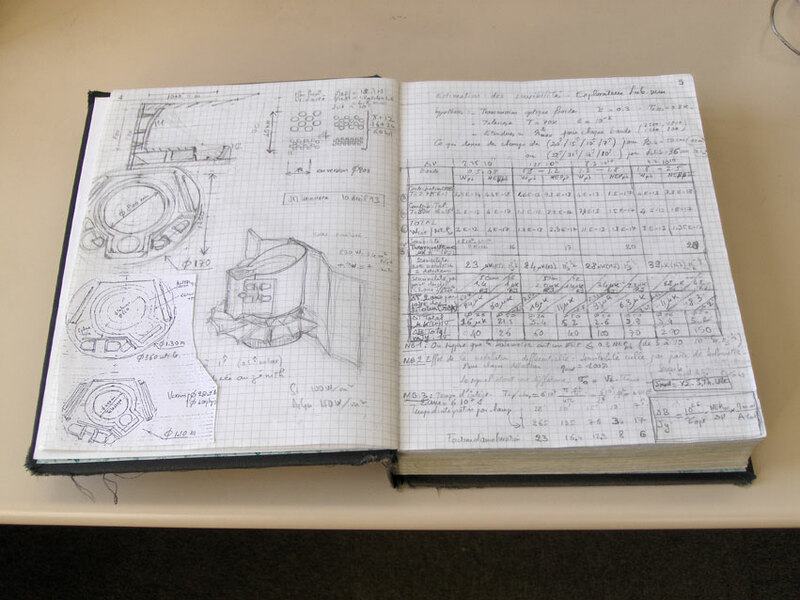 During the last four years, this scientist and his team have devoted themselves full time to deciphering the data flux received. Thanks to its many spectral windows and it extreme sensitivity, the instrument measures the fossil radiation. However, it is also capable of measuring and eliminating the radiation of our own and neighboring galaxies. It has in this way revealed an exceedingly precise portrait of the young Universe: a snapshot going back to just 380 000 years after the big bang, without any of the « foreground » which would have messsed up the picture. This image of the sky furnishes first a confirmation: the standard scenario of the big bang does lead to a spectacular explanation of the observations. The scientists have been able to calculate the parameters of the model with unprecedented accuracy. Today, the cosmos consists of 4,9 % of ordinary matter, 26,8 % of dark matter and 68,3 % of dark energy. Its history began 13,82 billion years ago. These revised figures are far better than those furnished in 2010 by its predecossor, NASA’s Wilkinson Mapping Anisotropy Probe WMAP de la NASA, launched in 2001. However, detailed analysis of the data has highlighted a number of suprising features, which show up in particular at large scales : the variations of the fossil radiation over the sky have an amplitude of only about 0,003 %; they are 10 % smaller than predictions. The disagreement is small, but nevertheless definitely significative ; in contrast, the small scale fluctuations are quite compatible with theory. Another anomaly, possibly related to the first, is that the fossil radiation from two diametrically opposed directions in the two hemispheres has a slightly different intensity. Finally, there is no doubt, but with no explanation, that that large cold regions are observed in the cosmological background radiation. 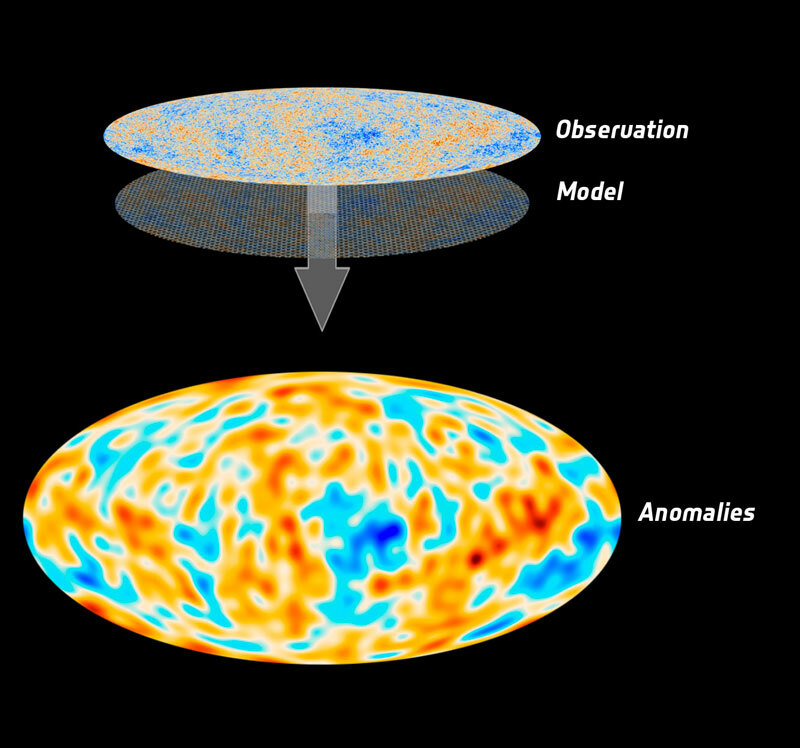 When compared to the best fit of observations to the standard model of cosmology, Planck’s high-precision capabilities reveal that the fluctuations in the cosmic microwave background at large scales are not as strong as expected. The graphic shows a map derived from the difference between the two, which is representative of what the anomalies could look like. A more complex cosmic texture? The cosmological radiation traces the variations in the temperature and density of the primordial Universe. The warmest and the coldest areas are attributed to matter concentrations, which were the seeds of future galaxies, stars and planets, and also of life. Their study will teach us about the material and energetic content of space-time. The perfection of a natural object which is as complex as the Universe, such as revealed by the data available till now, was already a source of profound amazement for the physicist. This is still so after the data sent by Planck. Nevertheless, the first cracks and splits in the edifice – a potential mine of discoveries – have perhaps begun to emerge. The above results are the subject of 29 scientific papers which will soon be published in the European journal Astronomy & Astrophysics. The first preliminary versions will appear on the internet on Thursday 21st of March 2013. Planck is a European Space Agency satellite, constructed by Thales and launched on the 14th of May 2009by Ariane 5, from Kourou, Guyana. It then studied the light emitted by the newly born Universe. Its purpose is to better understand the geometry and content of the cosmos, and to look back to the almost imperceptible inhomogeneities, which are the hypothetical ancestors of galaxies. The 4 m x 4 m x 4,2 m sateliite carries a 1,5 m diameter telescope, and two instruments which map the radiation in the wavelength band between 0,3 mm and 1 cm. The French High Frequency Instrumet HFI has 52 bolometers cooled down to a temperature of one tenth of a degree above absolute zero and are sensitive to radiation intensities less than 10 billionth of a billionth of a watt: this was a remarkable technological achievement. The Planck HFI instrument was designed and built by an international consortium of laboratories, universities and institutes, with important contributions from the industry. It was funded in particular by CNES, CNRS, NASA, STFC and ASI. Its building was supervised by the Institut d’Astrophysique Spatiale d’Orsay , and by an international consortium of research laboratories, which include the LERMA at the Observatoire de Paris and the Astroparticule et Cosmologie APC . The Institut d’Astrophysique de Paris , is involved in the development of the scientific objectives and data processing. Jean-Michel Lamarre, Alain Coulais, Édith Falgarone, François Levrier have been working for 10-20 ans on the Planck project. They are currently analysing the results from the flight. The APC team, on the Paris Diderot University site, is directed by Yannick Giraud-Héraud. 1993. Planck satellite’s birth certificate, from the researcher’s personal archives. The Astroparticule et Cosmologie laboratory is a member of the Paris-rive gauche campus of the Paris Diderot University. It is associated with the CNRS, with the CEA and with the Observatoire de Paris.